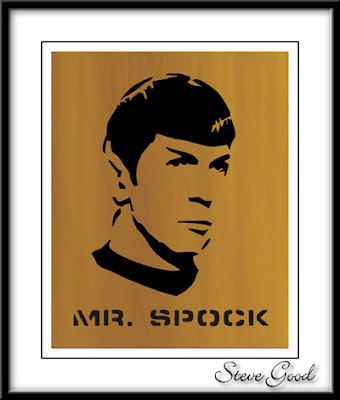 Mr. Spock the half-human, half-vulcan character from the 1960's television series Star Trek is a favorite among science fictions fans. Spock was played by Leonard Nimoy. The show only lasted three seasons and was canceled for low ratings in 1969. 40 years later with movies, cartoons, books and television spin offs it's hard to believe it got the hook so quick. I usually cut portrait patterns from 1/8" baltic birch plywood. I back the pattern with colored felt and frame behind glass. Cut the plywood to 8x10 inches before you mount the pattern. Many people use spiral blades to cut portraits but you can use regular blades if you are more comfortable with them.